Storyline 3 lets you quickly find and replace fonts throughout a project. Go to the Home tab on the Storyline ribbon, click the drop-down arrow beside Find/Replace, and choose Replace Fonts. Use the Replace drop-down list to select the font you want to replace. You’ll only see the fonts currently in use in your project. Then use the With drop-down list to choose a new font. 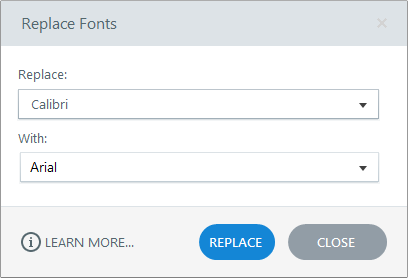 If you want to replace another font while the Replace Fonts window is still open, repeat steps 2-4. When you’re done, click Close to exit the window.